Mahesh Bhatt (born 20 September 1948) is an Indian film director, producer and screenwriter known for his works exclusively in Hindi cinema. A stand-out film from his earlier period is Saaransh (1984), screened at the 14th Moscow International Film Festival. It became India's official entry for the Academy Award for Best Foreign Language Film for that year. The 1986 film Naam was his first piece of commercial cinema. In 1987, he turned producer with the film Kabzaa under the banner, "Vishesh Films", with his brother Mukesh Bhatt. Bhatt went on to become one of the most recognized directors of the Indian film industry in the next decade, giving both art-house works such as Daddy (1989) and Swayam (1991), as well as commercial romantic hits like Awaargi (1990), Aashiqui (1990) and Dil Hai Ki Manta Nahin (1991), in which he cast Pooja with actor Aamir Khan. He next directed Sadak (1991) which remains his highest grossing either directed or produced under the banner, "Vishesh Films". 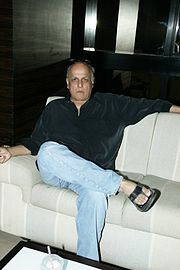 During the 1990s Bhatt won critical acclaim for Sir (1993), along with other hits such as Gumraah (1993) and Criminal (1994). In 1994 he won the National Film Award – Special Jury Award for directing Hum Hain Rahi Pyar Ke (1993). In 1999, he directed the autobiographical Zakhm, which has garnered the Nargis Dutt Award for Best Feature Film on National Integration. Bhatt has produced contemporary films such as Jism, Murder and Woh Lamhe. He co-owns film producing company Vishesh Films with his brother Mukesh Bhatt. Bhatt was born to Nanabhai Bhatt and Shirin Mohammad Ali. Bhatt's father was a Hindu Nagar Brahmin and his mother was a Gujarati Muslim. Among his siblings is the Indian film producer Mukesh Bhatt. Mahesh Bhatt did his schooling from Don Bosco High School, Matunga. While still in school, Bhatt started summer jobs to earn money, while also making product advertisements. He was introduced to film director Raj Khosla through acquaintances. Bhatt thus started as assistant director to Khosla. Bhatt married his first wife Kiran (born Lorraine Bright) whom he had met while still a student. His romance with her was the inspiration for his film Aashiqui. Bhatt and Kiran had two children (Pooja Bhatt and Rahul Bhatt) but his marriage stumbled following the difficulties of his early career. Bhatt later fell in love with actress Soni Razdan and married her. Bhatt and Soni have two daughters Shaheen Bhatt and Alia Bhatt. At the age 26, Bhatt made his debut as a director with the film Manzilein Aur Bhi Hain in 1974. His 1979 Lahu Ke Do Rang, starring Shabana Azmi and Vinod Khanna in lead roles, won two Filmfare Awards in 1980: Helen received her first Filmfare as Best Supporting Actress and Madhukar Shinde won it for Best Art Direction. The film did "above average" at the box office. He was noticed and received great critical acclaim with art film Arth (1982), when he turned to his personal life for inspiration but doubt persists as to whether it is an original film. Later, he made many more films taking insights from his personal life wherein he highlighted personal narratives ranging from out-of-wedlock birth, to extramarital affair, and created critically acclaimed works such as Janam (1985) and Saaransh (1984), an exploration of an old couple's anxieties in a universe governed by arbitrary violence, (1986). Bhatt had one of his biggest releases with musical romance film Aashiqui (1990), in collaboration with T-Series. The film launched Rahul Roy, Anu Agarwal and Deepak Tijori in the lead roles and became a major commercial success due to the hugely popular soundtrack by Nadeem-Shravan, which catapulted the music director duo into stardom. He launched his daughter Pooja Bhatt as a lead actress opposite Aamir Khan in Dil Hai Ki Manta Nahin (1991). The film was a commercial success and hugely acclaimed for its soundtrack. Bhatt's directorial Saathi (1991) was the only major success for Aditya Pancholi as a lead actor, thus giving a boost to his career. It was the biggest hit of the actor's career. Bhatt's biggest release during that time was Sir (1993). The film launched Atul Agnihotri opposite Pooja Bhatt and Naseeruddin Shah was featured in the title role of an aspiring and dedicated teacher. The film was a commercial success and gained critical acclaim for Bhatt's direction and the acting of Shah, Pooja, Agnihotri and Paresh Rawal. The film had an acclaimed and popular soundtrack by Anu Malik, which gave a boost to the music director's stellar career and he joined the league of top music directors of Bollywood. In 1995 he moved to television, then a newly opening medium in India. He made two TV series in 1995: the English language A Mouthful of Sky written by Ashok Banker and the popular Hindi language serial Swabhimaan scripted by writer Shobha De. He directed another TV series, Kabhie Kabhie, in 1997 which was written by Anurag Kashyap, Vinta Nanda and Kamlesh Kunti Singh. He is known to have copied many Hollywood movies into mainstream Hindi movies without even acknowledging it. For example, Fugitive was remade in Hindi as Criminal. He has many times copied portion of Hollywood movie scene and enacts into his films. Following this, he directed dramas like Dastak (1996), the debut film of Miss Universe 1994-turned-actress Sushmita Sen, and Tamanna (1997), and tried his hand at comedy with Duplicate in 1998. Zakhm (1998) based on the Mumbai riots of 1993. His last film as director was Kartoos (1999). Thereafter, Bhatt retired a director and took to screenwriting, churning out stories and screenplays for over twenty films, many of which were box-office successes, like Dushman, Raaz, Murder (2004), Gangster (2006), Woh Lamhe (2006), based on the life of actress Parveen Babi, along with many more. His banner vishesh films still continues operating today as one of Indian Cinemas leading production banners. Bhatt entered into the world of theatre with his protege Imran Zahid as of now he has produced three plays.The Last Salute, based on Muntadhar al-Zaidi's book of the same title, a journalist investigating atrocities Trial of Errors, that opened on 29 March 2013 in Delhi. stage adaptation of Bhatt of his movie, Arth (film)., Bhatt also produced The Last Salute, a play directed by Arvind Gaur, based on Muntadhar al-Zaidi's book, starring Imran Zahid. Bhatt is co-owner of film production house, Vishesh Films, with Mukesh Bhatt. He is a member of the advisory board of U.S. nonprofit TeachAIDS. He has hosted some episodes of two science magazine programmes - Turning Point and Imaging Science on Doordarshan in 1990s. As of December 2018[update] Bhatt was a member of the Board of Patrons of the Mother Theresa Awards. Bhatt believes the Congress party is committed to secularism. In the 2014 Lok Sabha elections, he campaigned in a Karvan-e-Bedari (caravan of awareness) asking people to vote for Congress and defeat BJP's Prime Ministerial candidate Narendra Modi, as he believes that Mr. Modi is communal. Bhatt also criticizes the communal record of Congress Party, for its role in 1984 Sikh genocide. He is planning to make a film, which will address the 1984 Sikh genocide that took place in Delhi. Bhatt fell in love with Lorraine Bright and got married when he was 20 years old. Bright changed her name to Kiran Bhatt. The couple have two children, a daughter Pooja Bhatt, a former actress, now a producer, and a son Rahul Bhatt, an aspiring actor. The marriage ended when Bhatt had an affair with the glamorous actress of the 1970s, Parveen Babi. The affair did not last long. Bhatt later married Soni Razdan in 1986. The couple have two daughters, Shaheen Bhatt and Alia Bhatt. Emraan Hashmi is his cousin Anwar Hashmi's son and thus his nephew. In the 1970s, he became a follower of Osho, and later found spiritual companionship and guidance with philosopher, U.G. Krishnamurti. Bhatt calls Krishnamurti his lifeline and says "Take him away, and I am empty". Bhatt in 1992 wrote Krishnamurti's biography titled U.G. Krishnamurti, A Life. Apart from this he has edited several books based on conversations with U.G. Krishnamurti. Bhatt's latest book A Taste of Life: The Last Days of U.G. Krishnamurti was published in June 2009. Mahesh Bhatt is of Kashmiri Pandit origin, and has been involved in campaigning for the cause of Kashmiri Pandit resettlement in the valley. As a director and producer, Mahesh Bhatt has a legacy of mentoring many actors and actresses and launching their careers, giving big names to Bollywood. He is notable for launching the careers of Anupam Kher in Saaransh (1984), Rahul Roy, Anu Agarwal and Deepak Tijori in Aashiqui (1990), daughter Pooja Bhatt in Dil Hai Ki Manta Nahin and Sadak (1991), Atul Agnihotri in Sir (1993), Sonali Bendre in Naaraaz (1994), Samir Soni in A Mouthful of Sky (1995), Sharad Kapoor, Sushmita Sen and Mukul Dev in Dastak (1996), Ashutosh Rana in Tamanna (1997), Manoj Bajpayee in Dastak (1996) and Tamanna (1997). Dushman (1998) and Sangharsh (1999), Aftab Shivdasani in Kasoor (2001), Dino Morea and Bipasha Basu in Raaz (2002), Aparna Tilak in Footpath (2003), Emraan Hashmi in Footpath and Murder (2004), Mallika Sherawat in Murder (2004), Kunal Khemu in Kalyug (2005), Shiney Ahuja and Kangana Ranaut in Gangster and Woh Lamhe (2006). Bhatt has also given breakthrough to many stars, bringing turning point in their careers. These names include Sanjay Dutt and Kumar Gaurav in Naam (1986), Aditya Pancholi in Saathi (1991), Aamir Khan in Dil Hai Ki Manta Nahin (1991), Juhi Chawla in Hum Hain Rahi Pyar Ke (1993), which also fetched her Filmfare Award for Best Actress and Paresh Rawal in Sir (1993). Bhatt is also known for his choice of music. Many composers had their first mainstream success in Bollywood while working with him. Nadeem-Shravan had their first hit album in Bollywood with Bhatt's directorial Aashiqui, which established them as the biggest music directors for the next decade. They would collaborate with Bhatt in many films to create successful soundtracks. Examples include Dil Hai Ki Manta Nahin, Sadak and Saathi (1991), Junoon (1992), Tadipaar and Hum Hain Rahi Pyar Ke (1993). Nadeem-Shravan went on to compose music for several productions of Vishesh Films. ^ Sawhney, Anubha (18 January 2003). "The Saraansh of Mahesh Bhatt's life". Times Of India. Retrieved 17 February 2012. ^ a b c d e f g Sawhney, Anubha (18 January 2003). "The Saraansh of Mahesh Bhatt's life". Times Of India. Retrieved 17 February 2012. ^ "My wife and my audience, both took time to understand me: Emraan Hashmi - Times of India". ^ "Mahesh Bhatt tours riot-ravaged Ahmedabad - Times of India". The Times of India. Retrieved 25 February 2019. ^ "Purnima". Internet Movie Database. Retrieved 29 May 2014. ^ "I have great reverence for women: Mahesh Bhatt". 01/18/2014. ^ "Mahesh Bhatt's article about Ramzan, Ramadan". Retrieved 14 December 2013. ^ "Lahu Ke Do Rang Awards". IMDB. Retrieved 21 February 2012. ^ "Box Office 1979". Boxofficeindia.com. Archived from the original on 20 October 2013. Retrieved 21 February 2012. ^ Kalsi, Jyoti (25 January 2011). "Mahesh Bhatt talks about 'The Last Salute'". Gulf News. Retrieved 5 April 2011. ^ "Review: Now, communalism and counter-insurgency ops on stage". Zee News. 30 March 2013. Retrieved 1 April 2013. ^ "Imran Zahid gets applaud in Mahesh Bhatt's 'Trial of Error'". The India Awaaz. 30 March 2013. Retrieved 1 April 2013. ^ Madhur Tankha (29 July 2013). "Arth stages a comeback". The Hindu. Retrieved 1 August 2013. ^ "Mahesh's next on Iraqi journalist". Retrieved 21 June 2013. ^ Uday Bhatia (19 January 2012). "A footwear-flinging Iraqi journalist inspires a new play, says Time Out". Time Out. Archived from the original on 19 March 2014. Retrieved 22 June 2013. ^ Mahesh Bhatt (14 May 2011). "Footprints of dissent, First Person-Mahesh Bhatt". The Hindu. Retrieved 21 June 2013. ^ Rana Siddiqui Zaman (3 June 2011). "Shoe act hits the stage". The Hindu. Retrieved 21 June 2013. ^ "Mahesh Bhatt, leading Indian cultural icon, joins the TeachAIDS Advisory Board". TeachAIDS. 31 October 2009. Retrieved 16 December 2010. ^ "Indian Science Communication Society". www.iscos.org. Retrieved 9 July 2016. ^ "Board of Patrons - Mother Teresa Memorial Awards". Mother Teresa Memorial Awards. Retrieved 31 December 2018. ^ "Mahesh Bhatt's karvan comes to Congress' rescue". Retrieved 26 April 2014. ^ "Modi is communal, should be defeated, says Mahesh Bhatt". Retrieved 26 April 2014. ^ "Mahesh Bhatt planning to make a film on 1984 Skih riots by Congress". Retrieved 31 May 2014. ^ Suparn Verma (19 March 1998). "The return of Razdan". Rediff.com. Retrieved 17 February 2012. ^ Mahesh Bhatt (1992). U.G. Krishnamurti, A Life. Viking. ^ Mahesh Bhatt (2009). A taste of Life: The last Days of U.G. Krishnamurti. He considers himself as an alcoholic in one of the TV show with Rohit Roy, but eventually, he overcomes the alcoholism. Penguin Group India. ISBN 0-14-306716-8. ^ Khalid Bashir Ahmed (23 June 2017). "Kashmir, exposing the Myth behind the narrative". SAGE publishing India. Retrieved 26 August 2018. ^ "Anupam Kher's 'People' With Mahesh Bhatt Interview". YouTube. Republic. Retrieved 7 August 2017. ^ "30th National Film Awards – 1983" (PDF). Directorate of Film Festivals. Retrieved 13 January 2013. ^ "List of Indian Submissions for the Academy Award for Best Foreign Language Film". Film Federation of India. Retrieved 29 March 2013. ^ India (9 October 2015). "'Dushman' will bring Indians, Pakistanis closer: Mahesh Bhatt". The Indian Express. Retrieved 11 October 2015. ^ "Viraf Patel and Barkha Bisht to star in Mahesh Bhatt s show Namkaran". 28 July 2016. ^ Bureau, ABP News. "Noted TV actress set to make comeback with Star Plus!". ^ Mahesh, Shweta. "Mahesh Bhatt brings Aashiqui 2 on Colors as Tu Aashiquii - watch promo". Retrieved 27 August 2017. Wikimedia Commons has media related to Mahesh Bhatt.